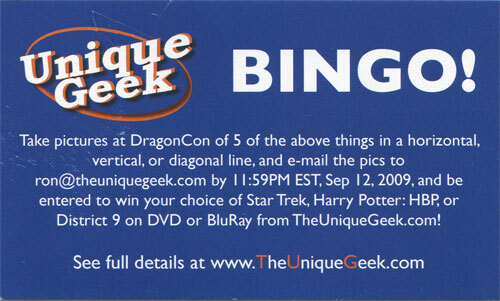 Coverage of Dragon*Con 2009 continues here! To read about Friday, click here. If you’d like to see over 600 pictures I took at the event, you can view them on Flickr and THE UNIQUE GEEK photo gallery. After the WAR OF THE SNORE the night before, Choco Taco and I decided to grab some breakfast. Thankfully we had access to the Executive Level in the Hilton where they supply complimentary breakfast. Turns out that many of the celebrities also have access to the Executive Level. So there we were eating, while a couple tables over were Tom Felton (Draco Malfoy from Harry Potter), Adam Savage (Mythbusters), Michael Hogan (Colonel Tigh on Battlestar Galactica), Neil Innes (best known for his collaborative work with Monty Python), and others. It was neat being with so many celebrities during their down time. As I looked around the room trying to identify everyone, I wondered if they were looking at us trying to figure out if we were famous too. Probably not, but a boy can dream. We then made our way to the parade. We got there minutes before the parade started, so we didn’t have a great view. Last year there were approximately 3,500 spectators for the parade; I’d say we had more this year. The parade was pretty good this year. The Colonial Marines lead the parade and the Star Wars characters finished it. In-between were the usuals like the Cobras, Star Trekkies/Trekkers, superheroes, Middle Earth folk, pirates, Stargate folks, Battlestar Galactica folks, horror folks, Ghostbusters, Doctor Whovians, Anime folks, and many, many more. I’ve got over 100 pictures of the parade up on Flickr and THE UNIQUE GEEK photo gallery. 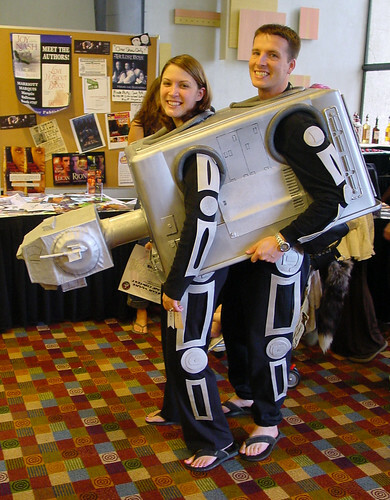 The most creative parade costume I felt was the two-person AT-AT. Unfortunately, my pictures of the AT-AT didn’t turn out that great, so here is a pic from the costume creators. A really clever idea! After the parade I visited the Walk of Fame. I considered taking my picture with Eric Roberts since he was in Doctor Who, but I couldn’t bring myself to do it. I can’t stand his acting and really hated him in the Doctor Who TV movie. 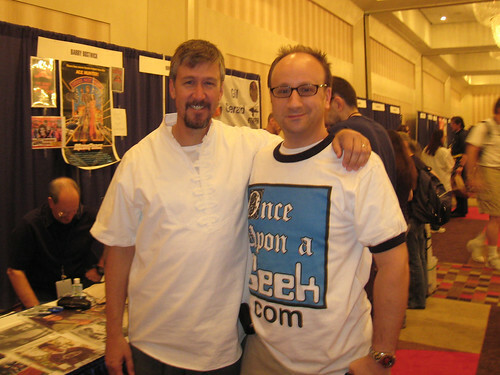 I did stop by and visit Alan Ruck (Ferris Bueller’s Day Off, Spin City, Star Trek: Generations). He was super cool! We shook hands (he offered his hand immediately) and he asked me my name. I’m not much for autographs, I usually prefer to get my picture taken with famous people. So we chatted for a few moments and then he came around the table for the photo. A couple days later, we were both on the same street corner waiting for the light to change. We started to chat and he remembered meeting me and shook my hand again. He was probably one of the nicest and most approachable celebrities I’ve ever met. Then I visited Dirk Benedict (Battlestar Galactica, A-Team). 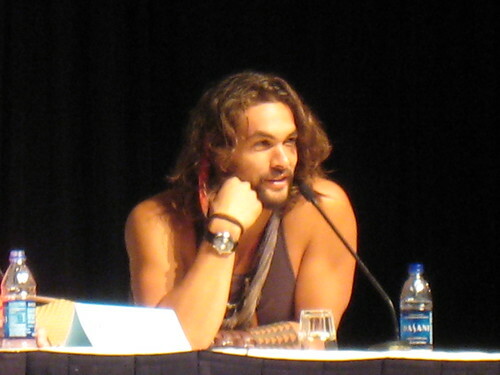 One of my goals at Dragon*Con this year was to meet him. To me he represents everything that was fun about television in the late 70’s and early 80’s. I had a question prepared that I didn’t get to ask during Friday’s A-Team panel, so I figured now was a good time. I asked if the scene with the Cylon in the A-Team opening credits was originally scripted, or was improvised on-set. He said the shot was his idea as a joke for the guys who weren’t there on-set that day. Apparently the Director didn’t want to do the shot, but Dirk convinced him to. Turns out the shot was so well-received, it ended up in the opening credits! After that I got my picture taken with him and also purchased one of his books. I’m about a quarter of the way through his first book, Confessions of a Kamikaze Cowboy: A True Story of Discovery, Acting, Health, Illness, Recovery And Life. The book covers his early life, his battle with cancer, the benefits of a macrobiotic diet, and taking control of your own health through diet. There is a lot of controversy surrounding his dietary suggestions, but it’s worth listening to. I don’t normally go in for autobiographies, and I REALLY don’t go in for health food propaganda. However, I’m really fascinated by this book and find myself questioning the way I eat. I’d recommend this book to anyone with an open mind. 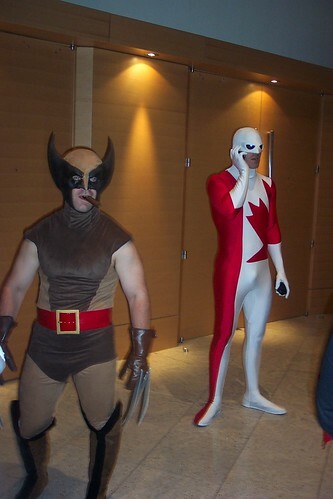 I then when hunting for more great costumes to take pictures of. I was shocked to find out I’d filled my memory card entirely after about 500 pictures! Wow! Thankfully I brought my laptop that has a built-in SD reader slot. So I downloaded all the pictures, cleared the memory card, and started off again. There were two panels I was planning to attend but was disappointed to find out they were canceled. Both the Eureka creator panel and the Leonard Nimoy panel were canceled for Saturday. Bummer. So instead I got in line for the Stargate Atlantis panel. I’ve seen some Stargate panels before at Dragon*Con. They’re very well organized and the guests are great, so I figured it was worth a shot. The line was insanely long. It went outside and wrapped around the building. I waited for about an hour with some very nice people and we had a great chat. Once we got inside we were lucky enough to find seats on the fifth row! That was awesome! While I’m not an expert on Stargate Atlantis, I have watched my fair share of episodes. The cast were funny, kind to the fans, and genuinely seemed to be having fun. One of the stars, Rachel Luttrell (Teyla), was late. So Joe Flanigan (Colonel Sheppard) called her on his cell phone. He held his phone to the microphone so we could all hear the conversation. He lied and told her the panel hadn’t started yet and the hilarity ensued! Throughout the panel they all had some really good banter and teased each other mercilessly. This panel was a blast. 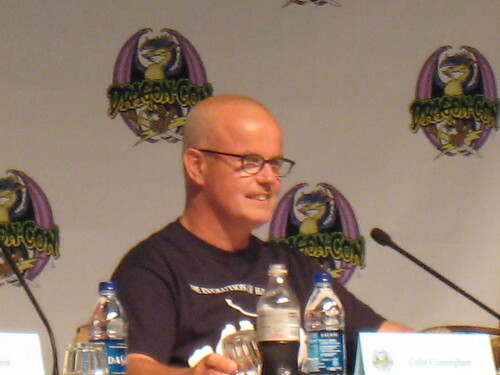 I’m going to be sure to attend more Stargate panels at future Dragon*Cons. After that I hit the Art Show. There I picked up my third Tom Fleming print. 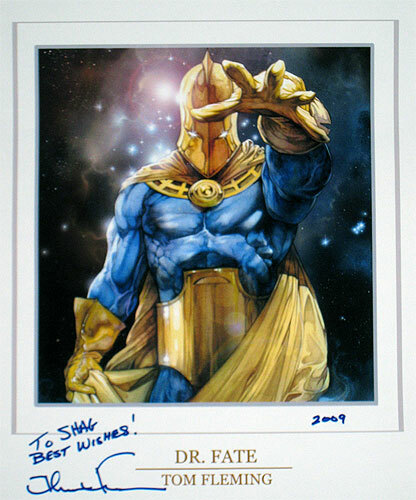 This time out it was Doctor Fate! I’ve already got an Aquaman and Firestorm from him. They look great framed in my office! He’s slowly working his way through the JSA, so I might pick up some more from him in the future. You can see more of Tom Fleming’s work by clicking here and clicking here. 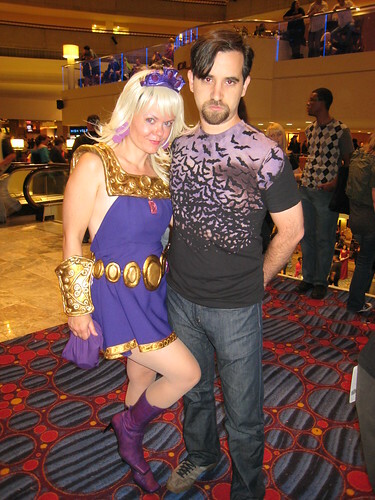 Later Ravenface and I came across someone in an Amethyst, Princess of Gemworld costume! We couldn’t believe it! You may recall a few months back Ravenface and I interviewed the creators of Amethyst for this blog (click here for more on that interview). 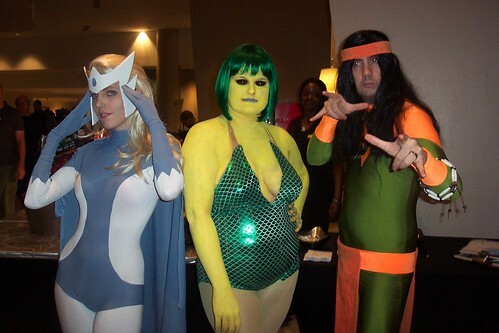 This was the first time either of us had ever seen someone dressed as Amethyst. We chatted with this lady for about ten minutes. She was super sweet and really was a big Amethyst fan. 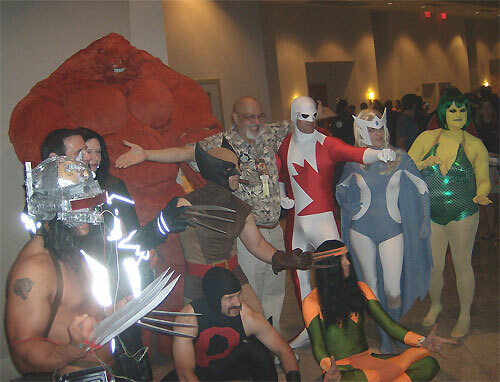 After that we witnessed the astonishing Alpha Flight photo shoot being organized. 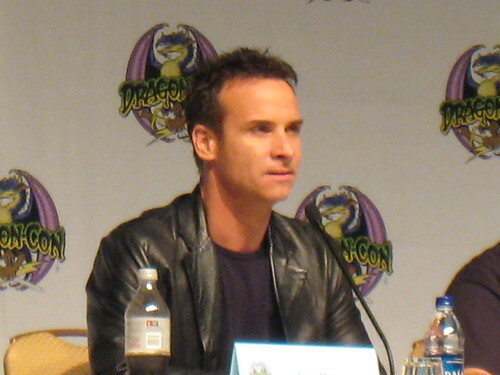 Allen (a.k.a. 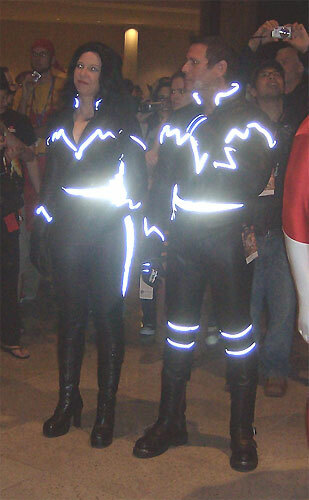 The Evil Twin) had dressed up as Firestorm last year for Dragon*Con. This year he created an impressive Sasquatch costume. Seriously, this costume was eight feet tall! You can read more about it on his blog. We were only there while they were preparing the photo shoot. So I’m using some pictures here from other photographers. 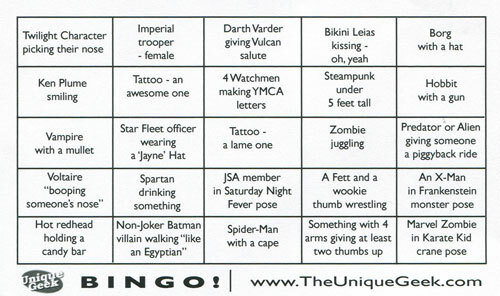 During the convention, some of our friends were handing out THE UNIQUE GEEK bingo cards. You can see the cards below. In order to qualify to win, you had to have very specific pictures. My old friend Shockwave took this challenge as a personal crusade. Through determination and cleverness, he managed to get a bingo! Way to go Shockwave. Below you’ll see one of his required photos, a JSA member in Saturday Night Fever pose. 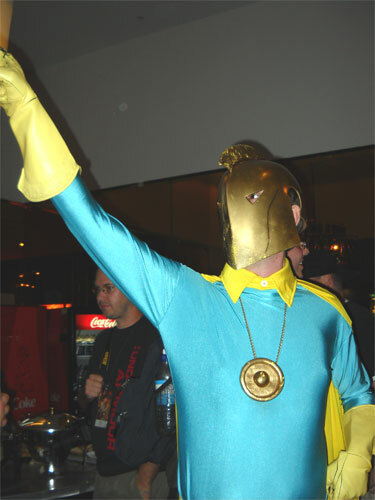 In this case, Doctor Fate discoing. Finally, from 10pm until 4am we were at the Nuts on the Road: Gonzo Sound & Vision film fest (presented by NeedCoffee.com and Quickstop Entertainment)! This thing is amazing! They play hilarious video clips all night long, taking breaks every hour to hand out thousands of dollars in prizes. Seriously! If you show up, you’re going to go home with something. More than likely you’ll go home with multiple prizes. This year I went home with Sideshow Collectibles gift cards, Batman The Brave & the Bold The Atom action figure, and a DC Universe Infinite Heroes action figure set with Bizarro, Supergirl, and Wonder Girl. There were also numerous packages of caffeinated mints, caffeinated chocolate chews, and Bacon-flavored chewing gum given out (or to be exact, thrown out to the audience). They offered a lot more prizes, but I declined as my suitcase was already beyond full. Also featured was an opening musical act, Neil Innes (best known for his collaborative work with Monty Python – yes, the same guy we saw at breakfast). There were other celebrities on-hand, such as Adam Savage (Mythbusters), Dr. Forrester & TV’s Frank (Mystery Science Theater 3000), Doc Hammer (Venture Bros), and more. As always, we had a phenomenal time. This year’s crop of comedy videos was possibly the best yet. 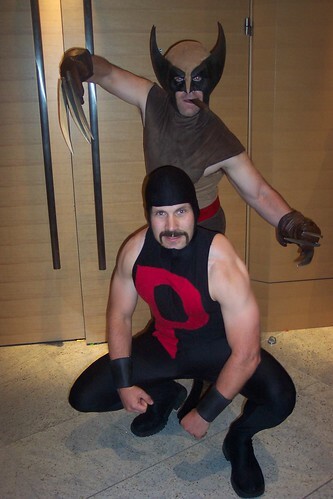 If you attend Dragon*Con next year, this event is a MUST! Below is a photo of THE UNIQUE GEEK gang around 4:00am after the event was over. Alan Ruck!! I am so bummed out that I didn’t get to meet him. Wow! Dirk Benedict looks like David Carradine! If David Carradine was still alive. Meeting Dirk Benedict would be a like a dream come true. I LOVE The A-Team. Congrats! It looks like you had a great time there.